What Does it Mean to be a Marine? Joining the Marine Corps League is noble and right for former Marines. Those of us that joined the Corps to serve our nation. Some made it their career, others stayed until it was all over and them resumed their lives as civilians, or reservist. All served honorably, but serving doesn’t end with a DD214. We that earned the Eagle, Globe, and Anchor, earned it forever, unlike those that served in other branches of our nations military. We were proud and there was something special to march on that grinder the last time, not as recruits but Marines. We learned such terms as Honor, Commitment, and Courage and what they mean. These same words have the same meaning to those that have joined the Marine Corps League. To serve our fellow veterans, Marines and communities that we live in. To be knitted together again in pride, fellowship and common loyalty as Marine Corps League members. We need to put away our petty differences, find that uncommon valor by serving actively in our detachment. We have more Marines that show up at the Coffee Klatch then at our business meetings or various other events and services that we perform. The MCL is a service organization as well one that is social. Being a member is a way we can once again do something for someone else with fellow Marines. In response to the person who talked about Marine Disease; I’ve discovered another condition; it’s called Chronic Marine Syndrome (CMS). This condition affects men and women of all ages. 1. Pride in oneself and the organization they represent. 2. A strong willingness to put in extra attention to detail to get the job done. 3. May wear articles of Marine clothing; T-shirts, jackets, watches, well into their 80’s. 4. Will not hesitate to stand up or put their hand over their heart, or even salute when the National Anthem is played. 5. Does not succumb easily to political correctness. 6. Is sure of who they are. 7. Is often either respected or hated by others, due to their abilities and talents. 8. May donate toys to needy kids at Christmas. 9. Some have been known to wear their hair in a high and tight well into their 90’s. 10. Will look you in the eye when talking to you. 11. Will give you a firm handshake. 12. Knows what honor, courage and commitment mean. 13. Can usually be found in some type of leadership position in whatever organization they work for. 14. Will often regard their drill instructors with the same respect as their parents. 15. Often found in either law enforcement or various professions. 16. Is extremely thorough at what they do. 17. Does not wear a bunch of patches to adorn their uniform. Their title of Marine is often sufficient. 18. Often arrives at work earlier than expected. If they wear a shirt and tie in their job, you might see the tie clip. between the third and fourth button centered. 19. Had spent time training at one of two places; Parris Island or San Diego. 20. May be able to field strip their rifle, up to 60 years after leaving active duty. 21. Can recite the nomenclature of the M1, M14 or M16. 22. May often have his pencils sharpened to a perfect precision point. 23. Will not back down from a fight. Other symptoms include willingness to take on a challenge and maintaining a positive attitude in the face of adversity. Yes, CMS is real, and very hard to treat. The person with this condition often utters phrases such as Once a Marine always a Marine, or OooooRah. Some may even say Semper Fi on many occasions. It is best if you know someone with this condition to just leave them be. 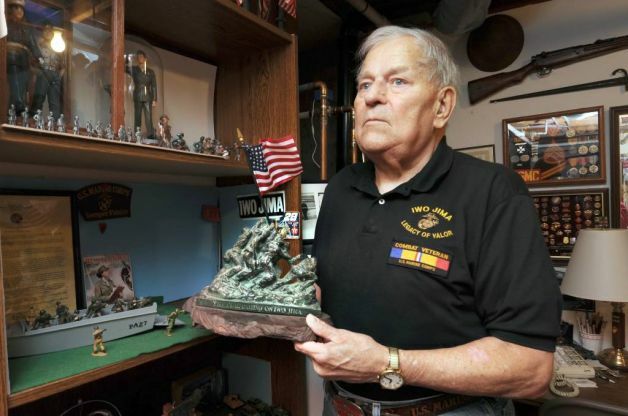 These people tend to be fiercely loyal to the Marine Corps. 3. Have them get memberships in organizations such as the Marine Corps League, The Marine Corps Association, Together We Served or have them join Leatherneck.com. 4. Some may require extra special attention such as buying items from grunt.com or watching movies about the Marine Corps, this is only natural and nothing to be afraid of. Whatever you do, remember that Chronic Marine Syndrome must be managed carefully. For example: In Michigan, a young man attempted to mug a Marine Korean War veteran who had advanced stages of chronic Marine Syndrome. It wasn’t pretty! The mugger was severely beaten and required multiple stitches. Remember folks, Chronic Marine Syndrome is real, while there may not be a cure, we can live with it. Any questions, please see your local Marine. or go to 1-800-IMA-Marine for more information. 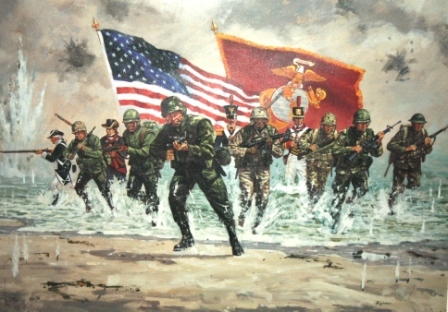 “I think that’s what makes Marines special, if only in our own minds, is that elusive Quality of Esprit De Corps. It’s the fact that we, as individual Marines, don’t feel that we are individual Marines. When we wear our uniform, when we hear our Hymn, when we go into battle, we are going with every other Marine who ever wore the uniform. The Marines Corps uniform doesn’t come off when our active duty is ov er. We wear it daily in our attitude, and our love of Corps and country. We wear it on our tattoos and our bumper stickers. We wear it in our hearts. It’s the most important part of who and what we are. Some say we’re arrogant. We say we’re proud. We have a right to be proud. We are the United States Marines. The most feared and ferocious group of warriors to walk the face of this earth. When Americas’ enemies formulate their battle plans, they plan on going around Marine units, because they now D-mn well that they can’t go through them. We are what other branches wish they were.